The International Encyclopaedia of Sports Law deals with international and national sports law. For both levels, the encyclopaedia will include the texts of the laws and the regulations of the sports organisations. This constitutes the "codex" volume. As far as monographs are concerned, the preferred approach is to structure the encyclopaedia by jurisdiction, in which various issues will be dealt with (according to a similar table of contents). In this approach a main division of the encyclopaedia is seen in three parts, namely international, regional and national. For each level, similar topics should be dealt with, like those mentioned below. An introductory part may precede the other parts. For each level of jurisdiction, a further distinction will be made between public regulation (laws and regulation from governmental authorities) and private regulation (regulation and by-laws from sports organisations, like IOC, FIFA, etc.). The Author. Table of contents. List of abbreviations. Preface. Part. I. Organisation of Sport. Part II. Sport and Employment. Part III. Doping and Sport. Part IV. Sport and commerce. 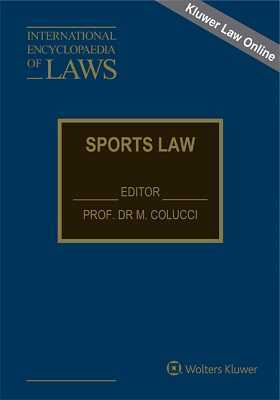 GENERAL SECTION: List of Contributors; Introducing the International Encyclopaedia of Sports Law; Curriculum Vitae of the Editor. Sports Law International Advisory Board.